Lucy Banning was born into a privileged family and has never had a need gone unmet in her entire life. But while she may live on the prosperous Prairie Avenue in Chicago, she has a heart for those who are not so fortunate. Much to her mother and fiancé’s chagrin, she spends the time that should be spent planning her wedding helping at a local orphanage. Her family would be even more upset if they knew that she was attending Art History classes at university, but this is one secret that she’s determined to keep. Lucy will not allow herself to be restrained into the position that society and her family demands that she mould to, and she becomes all the more restless as talk of her upcoming marriage to family friend, Daniel, begins to dominate her life. She cannot bear the thought of a life spent with Daniel, no matter how much she cares for him as a friend. But breaking off her engagement and living the life she wants to lead – helping the needy, furthering the cause of women and attending university – is not as easy as she thought it would be. Lucy faces many unexpected challenges as she makes the necessary changes to her life, including an unlikely friendship with a housemaid and the possibility of a blossoming relationship with a young architect who is definitely not of her class. Can she risk all that she has for those that understand the desires of her heart? I have a terrible confession to make: I requested this book purely based on the front cover, and I was determined to read The Pursuit of Lucy Banning even before I knew what the novel was about. And after having now devoured this novel, it seems rather amusing that it was Lucy’s gorgeous dress that drew me to the cover, when she spends a lot of the novel wearing simple clothing as she doesn’t want to stand out at the orphanage where she works, or in her classes at the university. By the time I got around to starting this book, I’d actually forgotten what it was about, and could only remember the pretty cover. So I was pleasantly surprised to find that this was far more than your standard historical romance novel. While The Pursuit of Lucy Banning is set in nineteenth century America – an incredibly popular time period and setting for Christian historical romances – it’s set at the very end of the century, amidst the growth of the metropolis and of industry. The streetcar has been invented, and there is talk of some crazy contraption called a Ferris Wheel. While I know a fair amount about the history of Britain in this period, my knowledge of American history at this time is much more basic, so I did have to look up the Gilded Age and the World’s Fair, the latter of which is the focal point of this novel. Don’t let this put you off – a brief glance at Wikipedia was enough to make the details in this novel fall into place for me. And there are a lot of details; Olivia has evidently spent a lot of time researching all of the build up to the World’s Fair. The city of Chicago really comes to life in this novel, and I could really picture the busyness of the streets full of carriages and streetcars. The Pursuit of Lucy Banning shows that there is far more to late nineteenth century America than all the novels about homesteading and prairie life would have you believe. If Little House on the Prairie really isn’t your thing, then perhaps The Pursuit of Lucy Banning is the sort of novel you should be checking out. I never thought I would be so captivated by a novel set in a city and surrounded by so much industry and technological development, but something about Chicago in this period was both exciting and romantic. While the title suggests that this book revolves entirely around Lucy, this isn’t exactly the case. The majority of the novel does focus on Lucy’s struggles with the role which society and her family expects her to fulfil, she’s also joined by the wonderful character of Charlotte, a maid in the Banning household. Having read Julie Klassen’s The Maid of Fairbourne Hall last month, as well as studying a fair amount about Victorian domestic servants at university, I was thrilled to discover that Olivia had chosen to explore both sides of the Banning household. The world of service is literally that; an entirely different world. I loved the interplay between Lucy and Charlotte as they become confidants. Despite their differences in class, Lucy and Charlotte were both visual representations of the restrictions placed upon women in this time period by an intrinsically male-dominated society. Daniel, Lucy’s fiancé, represented this masculine, controlling society. While I was initially sceptical about the almost villainous turns that his character took, I couldn’t help but care for Lucy and fear for the control that Daniel exerted over her life. It took me a while to understand that he wasn’t being a brainless menace, as some villains are, but simply taking advantage of the control that any man had over a woman in this period. This image was powerful but also understated. I have to say that it was the development of Daniel’s character that could have really influenced my impression of this novel. I’m not keen on characters who seem to be overtly villainous with no redeeming qualities, but Daniel wasn’t like this. His controlling character developed slowly, and the turn that it took at the end of the novel really endeared me to this book. Olivia didn’t slip into stereotyping, and also managed to teach some contemporary lessons about mental health. Along with the society commentary about women and mystery surrounding Daniel, there’s also an element of romance in this novel, although it isn’t the focal point. Much as Lucy’s aims in life aren’t centred around falling in love, this novel doesn’t focus primarily on her love life. Despite this, I did enjoy the way that Lucy’s relationship with Will developed. She didn’t swoon or spend hours pining over him, but they clearly cared deeply for each other. Perhaps some romance readers will be disappointed that Lucy isn’t more enamoured with Will, but I found their relationship to be very realistic. It was nice to read about such a simple relationship that was complicated by external events, rather than misunderstandings or confused emotions. Sometimes I’m fortunate enough to read a wonderful book and then discover that the author has an entire backlist that I can dip into. With The Pursuit of Lucy Banning this isn’t the case, and I’m very impressed that this is only her debut novel. 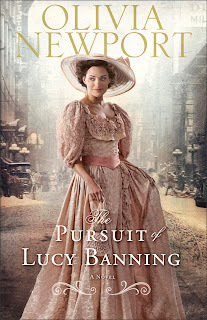 Exploring a time period and setting that is entirely new to me, The Pursuit of Lucy Banning had just the right blend of historical detail, mystery and romance to keep me gripped. The more I think about his book, the more I realise that I really can’t find any major flaws with it. I genuinely didn’t expect to love this book as much as I did, and I’m sure that other readers will be similarly pleased by this original debut novel.